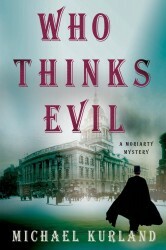 Michael Kurland’s latest novel, WHO THINKS EVIL, represents the fifth in his series featuring Sherlock Holmes’ famed nemesis, Professor James Moriarty.Moriarty is awaiting trial for murder when Queen Victoria’s grandson mysteriously disappears. In exchange for his release and the murder charges (of which he’s innocent) being dropped, the so-called “Napoleon of Crime” must track down the missing prince and find out who is behind his disappearance and the brutal murders left in his wake. I recently checked in with Michael to learn more about how this series came to be and where it is going from here. WHO THINKS EVIL is told from the point of view of Sherlock Holmes’ archenemy James Moriarty. How did this series begin? THE INFERNAL DEVICE was nominated for an Edgar and an American Book Award, which made me think that perhaps science fiction wasn’t my field after all. Following up on the success of his debut novel, THE MIDWIFE’S TALE, Sam Thomas revisits seventeenth century England with midwife Bridget Hodgson and her brassy servant Martha Hawkins in his second novel, THE HARLOT’S TALE. It is August 1645, one year since York fell into Puritan hands. As the city suffers through a brutal summer heat, Bridget Hodgson and Martha Hawkins are drawn into a murder investigation more frightening than their last. In order to appease God’s wrath—and end the heat-wave—the city’s overlords have launched a brutal campaign to whip the city’s sinners into godliness. But for someone in York, this is not enough. First a prostitute and her client are found stabbed to death, then a pair of adulterers are beaten and strangled. York’s sinners have been targeted for execution. Bridget and Martha—assisted once again by Will, Bridget’s good-hearted nephew—race to find the killer even as he adds more bodies to his tally. You probably get this a lot, but I have to ask; how does a male college professor get so interested in midwifery? It was the first of many coincidences. I was working on my doctoral thesis—which was about religious toleration in seventeenth century England—when I stumbled across the will left by the midwife upon whom I based my protagonist, Bridget Hodgson. As it happened, at the very moment I found the will, the history of midwifery was being rewritten and I was able to get in on a hot topic. Lisa Morton’s new novel, NETHERWORLD takes readers back to nineteenth-century Victorian England, where a young widow finds that she has inherited more than her late husband’s property: The Furnavals serve as the ancestral keepers of supernatural portals scattered around the globe. When demonic entities begin crossing over from the Netherworld, Lady Diana realizes that a war is brewing, and she must be the one to confront it. Your story is rich with details about the fantastic and the gothic, which showed your interest in supernatural fantasy. What is your attraction to the genre? I’ve always loved the darker side of fantasy—as a child I was hopelessly obsessed with the Universal monster movies. But as an adult, I think one of the things I most enjoy about writing within the genre is the way it can be used to comment obliquely on contemporary or relevant topics. In NETHERWORLD, for instance, I got to use a trip around the globe in search of demonic forces to comment on the Industrial Revolution, imperialism, and gender roles. Here’s a brief description of Antonio Garrido’s new novel THE SCRIBE: The year is 799, and King Charlemagne awaits coronation as the Holy Roman emperor. But in the town of Würzburg, the young, willful Theresa dreams only of following in the footsteps of her scholarly father—a quiet man who taught her the forbidden pleasures of reading and writing. Though it was unthinkable for a medieval woman to pursue a career as a craftsperson, headstrong Theresa convinces the parchment-makers’ guild to test her. If she passes, it means access to her beloved manuscripts and nothing less than true independence. But as she treats the skins before an audience of jeering workmen, unimaginable tragedy strikes—tearing apart Theresa’s family and setting in motion a cascade of mysteries that Theresa must solve if she hopes to stay alive and save her family. Mr. Garrido agreed to response a few questions posed to him in Spanish. I trust I kept the spirit of the ideas from his responses, with a bit of luck, nothing got lost in the translation. How extensive was the research for THE SCRIBE? Almost as extensive a thesis for a PH.D. You have to consider that in spite of the exciting events told, THE SCRIBE is inspired in real life, which meant that all the data was thoroughly crosschecked. The research lasted four years and took me to various museums and libraries in places like Germany, France, United Kingdom, and Italy. In Judith Rock’s latest book, THE WHISPERING OF BONES, the last thing Jesuit Charles du Luc and his elderly confessor expect to find on an autumn day in 1687 when they go to pray in an ancient church crypt outside Paris is a murdered man—a very young man who was about to enter their order. Then another Jesuit disappears from the school Louis le Grand, where Charles teaches. And Charles discovers that a forged document from Poland, source of the dark myth gathering around the Society of Jesus, is circulating illegally in Paris. In the midst of this, the soldier who once saved Charles’s life enters the Jesuit Novice House, bringing Charles’s most shameful battlefield secret back to haunt him. As he tries to untangle this web, he sees that his efforts may well destroy his Jesuit future. I must confess I fell in love with this book from the moment I first read it. I had the privilege to pose some questions to the author. What can you tell us about Charles Du Luc, and his development for the fourth book in the series? Charles was wounded in the battle of St. Omer in 1677. While recovering, he read about the life of St. Ignatius of Loyola, founder of the Society of Jesus, and decided to become a Jesuit. He’s now twenty-nine and nearing the end of the long Jesuit training. After a lot of questioning and risking of his vocation, he knows that he wants to be ordained a priest—even though obedience has always been hard for him, and still is. As he faces the terrible secret from his army past, and is overtaken by the consequences of finding the body at the beginning of this book, he discovers that freedom is the unexpected other side of humility. Tasha Alexander is the NEW YORK TIMES bestselling author of the Lady Emily series and the novel ELIZABETH: THE GOLDEN AGE. She attended the University of Notre Dame, where she studied English and Medieval History. Her work has been nominated for numerous awards and has been translated into more than a dozen languages. She and her husband, novelist Andrew Grant, divide their time between Chicago and the UK. The victim makes a grand entrance at a social gathering and falls dead in the opening pages. You get the reader’s attention quickly don’t you? As the 8th book in the Lady Emily series does it seem the give-and-take between Lady Emily and her mother over a grim topic—such as murder–is something readers have come to anticipate? Emily and her mother have, at best, a sometimes-peaceful standoff. Their views on most things—women’s suffrage, education, appropriate social behavior, and child-rearing—clash, but there is a great deal of humor in their exchanges, and readers are kind enough to tell me they enjoy them. Lady Bromley, however, might not find them quite so amusing. Raymond Chandler said that one of the characteristics of crime fiction (for want of a better name) is the unnatural squeezing up of timeframes. The same thing applies to history when it is dragged, willingly or otherwise, into the world of crime writing. But why squeeze all that up at all? The answer to why any of us write anything is always that we all write what we love writing. We take what interests us and intrigues us and we try to turn that into a story. But that doesn’t mean there isn’t usually a bit more to it as well. We probably spend too much time putting fiction into genres and sub-genres these days, but the historical crime novel is clearly a genre of some kind, combining as it does two resiliently popular areas of fiction: history and mystery. But it has an odd quality that a contemporary setting doesn’t demand. You can’t play fast and loose with the past the way you can with the present. Readers expect their history to be historical! Especially if your detective is going to stumble into real events and real people along the way. When I started the first of a series of crime novels set in Ireland in the 30s and 40s, THE CITY OF SHADOWS, part of the pleasure and part of the purpose was to explore that time, in particular the way the Second World War touched Ireland, and over the series to ‘visit’ a number of cities that were sometimes at the heart of that war and sometimes at its compromised periphery: Dublin, Danzig, New York, Lisbon, Paris, Berlin, London, Rome. Are you ready? The wait for the fourth novel in Raymond Khoury’s international bestselling series featuring FBI Agent Sean Reilly is finally over. RASPUTIN’S SHADOW goes on sale in October. RASPUTIN’S SHADOW opens on a cold, bleak day in 1916. A mining pit in Siberia turns into a bloodbath when its miners attack each other, savagely and ferociously. Minutes later, two men—a horrified scientist and Grigory Rasputin, trusted confidant of the tsar—hit a detonator, blowing up the mine to conceal all evidence of the carnage. In the present day, FBI agent Sean Reilly is tasked with a new, disturbing case. A Russian embassy attaché seems to have committed suicide by jumping out of a fourth-floor window in Queens. The apartment’s owners, a retired high school teacher and his wife, have gone missing, while a faceless killer is roaming New York City, leaving a trail of death in his wake. Joined by Russian FSB agent Larisa Tchoumitcheva, Reilly’s investigation into the old man’s identity will uncover a deadly, desperate search for a mysterious device whose origins reach back in time to the darkest days of the Cold War and to Imperial Russia and which, in the wrong hands, could have a devastating impact on the modern world. Raymond Khoury was born in Beirut. He is a Scorpio, the youngest of three, and he was fourteen when civil war broke out in Lebanon and his parents moved the family to Rye, NY. He stayed there until he graduated from high school, and then moved back to Lebanon to study architecture at the American University of Beirut. Surviving repeated flare-ups of fighting and a couple of invasions, shortly after his college graduation, Khoury was again relocated—this time by the Marine Corp’s 22nd Amphibious Unit. He ended up in London. Bouncing around in his career, he eventually turned to his creative side. He wrote a screenplay that shortlisted him for the Fulbright Fellowship in Screenwriting award, and then a second script that was nominated for the same award a year later. Now after working as a screenwriter and a producer on shows like the BBC series SPOOKS, he is solely focused on his novels. I recently had the great fortune of asking him a few questions. Tracey Devlyn doesn’t believe in the muse. Her latest manuscript is A LADY’S SECRET WEAPON, which can be drilled down to this intriguing tweet-worthy synopsis: A boudoir spy joins forces with a notorious underworld informant to determine why boys are disappearing at one of London’s orphanages. It’s the third novel in her series of historical romantic thrillers, a genre that provides her – and her lucky readers – the ultimate in escapism. “Our modern world has become so complicated, immediate, and violent. It’s nice to spend some time in a period where the pace is a little slower and chivalry still exists,” she says. That doesn’t mean it’s less exciting. Quite the contrary. As a historical writer, Devlyn walks the fine line between fact and fiction, a delicate balance of historic truths and modern suspense. Going back in time may seem daunting, but for Devlyn, it’s no more overwhelming than the research that goes into many thriller novels set in modern times. With their second battle behind them, Leah Tallent and Gareth Lowery find themselves still knee-deep in hell. What should’ve ended with a celebration of passion wrapped in each others’ arms becomes a nightmare once more, as a mysterious man demands Leah to return home, or else her beloved father will be found at the bottom of the sea.This time out, the courageous duo has only seven days to travel to Athens where the original ‘Hero’s Companion’ awaits. From the stage atop the Acropolis where the most brilliant minds once performed to the discovery of a location that was never even proven to exist, ‘Great Mysteries’ come to life as Leah and Gareth work against time in order to stop a man from attaining the power he so desperately wants. But as she stands by the side of her own courageous warrior, Leah will soon find out that she’s in the crossfire of her own father’s secrets; a life of lies that’s far more frightening than anything she and Gareth have faced in the past. Karen Harper was recently able to catch up with busy Laura Joh Rowland whose career she has long admired. It takes talent to continue a mystery series for 17 novels, and the novels have grown in popularity with each one. Advice from such a successful writer is like gold. Thanks to Laura for a great interview. Please give us a short summary of your latest release, THE SHOGUN’S DAUGHTER. Japan 1704. The shogun’s daughter Tsuruhime dies of smallpox. Her death has immediate, serious consequences. Faced with his own mortality and beset by troubles caused by the recent earthquake, the shogun names as his heir Yoshisato, the seventeen-year-old son he only recently discovered is his. Yoshisato was raised as the illegitimate son of Yanagisawa, the shogun’s favorite advisor. Yanagisawa is also the longtime enemy of Sano Ichiro (the samurai detective hero in my series). Sano doubts that Yoshisato is really the shogun’s son, believing it’s a fraud and power-play devised by Yanagisawa. When Sano learns that Tsuruhime’s death may have been murder, he sets off on a dangerous investigation that leads to more death and destruction as he struggles to keep his pregnant wife Reiko and his children safe. While seeking the killer, he and his family become the accused. And this time, they may not survive the day. Sano Ichiro is a samurai detective. Readers might expect a detective hero, but what do his samurai talents add to his character and this story? Sano is pretty handy with a sword. Thrilling battle scenes are a staple of my series, and he’s been known to lop off a villain’s head once in a while. His wife Reiko is no slouch, either. That’s a little different from contemporary American crime fiction, in which guns and fists are the usual weapons. Laurie R. King began penning stories in 1987 when her youngest child entered school. By 1993, her first novel was published and she was well on her way to being a fulltime author. The award-winning, bestselling author has averaged a novel a year, making THE BONES OF PARIS her 23rd novel. As a third generation Northern Californian who has lived most of her life in the San Francisco Bay area, her background includes degrees in theology, managing a coffee store, raising children, vegetables, and even the occasional building. With six stand-alone novels, fourteen novels in the Mary Russell series, five novels in the Kate Martinelli series, and two novels in the Stuyvesant & Grey series, King has become well known in the mystery genre. THE BONES OF PARIS is the latest in the Stuyvesant & Grey series. Private investigator Harris Stuyvesant is living the dream. His latest assignment is based in Paris, France during the year 1929, and he’s paid to troll the cafés of Montparnasse, seeking out beautiful young women. He’s an American agent with a healthy appetite for la vie Bohéme, despite years at the US Bureau of Investigation. Instead, Will sets out to protect Elizabeth and prove his sanity. Will’s nemesis, Sapphira Xanakis, contacts him with news of a conspiracy to defeat the amendment, led by Andrew Murphy, head of the Michigan Licensed Beverage Association. Against his better judgment, Will believes she is trying to help. The man she directs him to dies under suspicious circumstances. An old acquaintance of Will’s, who is working for the MLBA, is shot and killed in front of him. Still, no one believes Will, including his former ally, Detective Riordan, who not only is unwilling to help, but seems to have secrets of his own. Writing under the pseudonym Sam Cabot, award-winning author S.J. Rozan and Professor Carlos Dews introduce BLOOD OF THE LAMB, the first book in their Novel of Secrets historical thriller series. In Rome, American Jesuit priest Thomas Kelly searches for an ancient document stolen from the Vatican. An enigmatic letter leads him to the work of a 19th Century poet, where Thomas discovers cryptic messages that might lead to the missing manuscript. His search unexpectedly entwines with that of Italian art historian Livia Pietro, who tells him destructive forces threaten to expose the document’s secrets. Mysterious men who would cross any line to obtain the document relentlessly chase Livia and Thomas through Rome. They surmise that the pages hold a devastating, long-buried truth. Livia, though, has a secret of her own: she and her People are vampires, called the Noantri. But all this pales in light of the Secret that Thomas and Livia discover together—a revelation more stunning than either could have imagined. Archaeologist Sarah Weston and anthropologist Daniel Madigan are working on the Qaryat al-Fau archaeological site in Saudi Arabia when they uncover a mysterious ancient scroll written in the form of a riddle. Sarah and Daniel follow a trail of clues leading to India, Jerusalem, and the Judean wilderness, where they discover the truth about the scroll: it was written by King Solomon as a map to an ancient manuscript containing an astounding revelation. Journeying through the worlds of the occult, corporate greed, geopolitical conflict, Judaic mysticism, and biblical archeology, Sarah and Daniel race against time and a formidable enemy to uncover the powerful ancient message that could have an explosive impact on modern Israel. But is the world ready for the revelation it contains? I caught up with MJ Rose (which is a challenge since MJ is one of the busiest Thriller Writers around!) for an interview to give us a quick peek into her next book, SEDUCTION. MJ writes amazing novels which are difficult to link to any one genre, and she’s one of the savviest promoters on the planet. Look for her at ThrillerFest in NYC in July. What she doesn’t anticipate is that the mystery surrounding Victor Hugo will threaten her sanity and put her very life at stake. SEDUCTION has a ghost story at its heart, and a mystery that spans centuries. Some small crimes have big, big consequences. When the Vienna police in 1901 seem indifferent to the murder of a young prostitute, Mitzi, her madam, the legendary Josephine Mutzenbacher, turns to lawyer and trouble-shooter Karl Werthen, who finds plenty of trouble. Mitzi has a secret past, and impressive roster of clients, leading Werthen to navigate a dangerous maze of high society and espionage. That’s the setup for THE KEEPER OF HANDS by J. Sydney Jones, an author who’s used Vienna for a number of novels including THE EMPTY MIRROR and THE SILENCE. He truly knows the place, having lived there on-and-off for decades in between working as a freelance writer in Paris, Florence, Donegal and Molyvos. Buenos Aires 1945: It is the most dramatic and tumultuous period in Argentine history. Colonel Juan Perón, who had been the most powerful and the most hated man in the country, has been forced out of power. Many people fear that his mistress, radio actress Evita Duarte, will use her skill at swaying the masses to restore him to office. When an obscure young woman is brutally murdered, police detective Roberto Leary concludes that the murderer mistook the girl for Evita, the intended target of someone out to eliminate the popular star from the political scene. The search for the killer soon involves the girl’s employer, who is Evita’s dressmaker, her journalist lover, and Pilar, a seamstress in the dress shop and a tango dancer. Two hundred years of war. An overwhelming, vast army, wielded by a ruthless despot, bent on the slaughter of all Christians remaining in the Holy Land. And only a few citizens remaining to defend Acre, the one city left standing against the hordes. Baldwin de Furnshill expected the threats of battle and danger, but he little knew that the battle for Acre would also become his journey from boyhood to man. This is the premise for TEMPLAR’S ACRE– the newest release from the “Master of Medieval Mystery,” Michael Jecks. Jecks is a British author who is no stranger to the world of thrillers. A countryman at heart, he was born near London, but family holidays in Devon made him realize that in the country was a maze of mystery and ages of history waiting to be unravelled. He initially embarked on the journey to author of medieval mystery after working thirteen years in computer sales. But, all that changed while on honeymoon in 1993 when he was fortunate to visit Fursdon House, which is still, seven hundred years later, held by the same family. He immediately began plotting his first novel, a medieval murder mystery set during the destruction of the Templars – a terrible, but exciting time in English history. David Morrell is ITW’s 2009 Thriller Master. Over four decades, from FIRST BLOOD through THE BROTHERHOOD OF THE ROSE and CREEPERS, he has pioneered new ways to write thrillers. With his latest, MURDER AS A FINE ART, Morrell journeys into 1854 London, blending fact with fiction in a harrowing exhumation of the infamous Ratcliffe Highway murders. For this month’s BIG THRILL, Morrell’s Mulholland Books editor Josh Kendall interviews him about the novel’s main character, Thomas De Quincey, one of the most fascinating personalities of Victorian England. Readers always enjoy hearing how an author found an idea for a book. What was the origin of MURDER AS A FINE ART? Exactly. But the film takes place in the 1850s, forty years before Freud’s theories began to be published. The reference was to Thomas De Quincey, who was famous for being the first person to write about drug addiction in CONFESSIONS OF AN ENGLISH OPIUM-EATER. I had read some of De Quincey’s work in a Victorian literature course when I was in college, but my professor never indicated that De Quincey anticipated Freud. In THE BARBED CROWN, the sixth Ethan Gage adventure, the American adventurer journeys to Paris in the company of a beautiful comtesse to thwart Napoleon’s ascension to emperor and avenge his wife. Being Ethan, he finds the royalist conspiracy in ruins, his wife unexpectedly alive, and his wealth in jeopardy, and is recruited to spy for both the English and French. He’s also on the path of a medieval relic and the Crown of Thorns from the crucifixion of Jesus. Caught up in Bonaparte’s desperate plan to invade England, the adventure takes Ethan from the catacombs of Paris to the battle of Trafalgar, tangling him with Talleyrand, Nelson, Emma Hamilton, and a host of other historical figures. For the readers who have not read your previous novels which feature Ethan Gage as your protagonist, please give us an overall review of his character, his strengths and weaknesses. Ethan is an American adventurer and treasure hunter caught up in the Napoleonic Wars. He’s a protégé of Benjamin Franklin and thus an “electrician,” a sharpshooter with an American long rifle, a gambler, a would-be womanizer in the earliest books (he soon meets the love of his life) and an independent man in a violent world where everyone is choosing sides. He’s an opportunist and a rascal, but moral in his own way. He’s also funny. Raymond Benson knows something about superheroes. He’s been writing larger than life franchises and tie-ins for METAL GEAR SOLID, HITMAN, and JAMES BOND for decades. It makes him the perfect author to reinvent the genre. Or perhaps, just like the Prog Rock (Jethro Tull, Yes, Gentle Giant) he loves returns to vogue every generation, it’s time for a return to a fresh, humanized hero, even if she is still super. THE BLACK STILETTO: STARS & STRIPES is the third book in a projected five novel series. Raymond, can you set up the series for those who have not read books one and two, please? It’s a story about a woman ahead of her time, fiercely independent in a world where women weren’t allowed to be so. She’s a feminist before that term was in our vernacular. And while it’s about a woman who puts on a costume and mask and fights crime—she has no superpowers, really. More importantly, it’s also a story about a woman with Alzheimer’s and her son and a story about a father and daughter. Here’s the cover copy for the third book. It’s 1960 in the third Black Stiletto book, and the Black Stiletto, in her civilian persona, Judy Cooper, volunteers to work for JFK’s presidential campaign, only to become involved in a devious behind-the-scenes plot that could change the course of history. In the present, Judy’s son, Martin, must deal with increasing mental health issues, his mother’s demise from Alzheimer’s, and a new woman in his life. And then there’s Gina, the Stiletto’s granddaughter, who is exhibiting evidence that she is more like her grandmother than Martin would like. Annie Kendall – American, architectural historian, ex-lush – takes an assignment that sends her to London seeking information about a man from Tudor times known as the Jew of Holborn, and his trove of ancient Judaica. The flat she’s subletting has two remarkable features: an extraordinary black and white mural, and an even more extraordinary ghost in whom she, of course, does not believe. Until she meets a TV pundit who looks exactly like him. And learns that the man bankrolling her assignment is up to his ears in very questionable Middle-Eastern politics, and has an agenda in which Annie is not the hunter but the hunted. The key to survival, for Annie and many others, is figuring out who the Jew of Holborn really was and what happened to him, a story that unfolds for Annie and the reader in the voices of the Jew himself, and the Carthusian monk now haunting Annie’s flat. Amy Lignor’s debut novel, 13, introduced the world to the intrepid adventures of Leah Tallent and Gareth Lowery. Now Tallent and Lowery are back in their exciting follow up, THE SAPPHIRE STORM. I recently checked in with Amy and asked her to give us some insight into the writing and editing process as well as what the future holds for the heroes of 13, and THE SAPPHIRE STORM. This book is the second in your Tallent and Lowery series. Can you tell us a little about the first book, 13, and how it figures into THE SAPPHIRE STORM? I actually try to separate each novel so they can be read as stand-alone adventures. However, with 13, Leah Tallent& Gareth Lowery are first introduced, and the book opens the door to their relationship, humor, and the way Leah’s incredible mind works. In 13, the puzzle that must be solved connects the haunted Winchester Mansion in California to Whitechapel to a very famous home on the shores of Loch Ness and then on to Glastonbury. The reader gets to follow each and every step with the team as they head into these historical places and try to stop villain from uncovering a site that needs to remain buried. Although, THE SAPPHIRE STORM does stand alone, being a completely new adventure, I still think Leah and Gareth’s first meet is so intriguing that the reader will want to be on board right from the beginning. Susanna Calkins is the author of A MURDER AT ROSAMUND’S GATE, a mystery set in turbulent 17th Century London, in a time of great religious and social upheaval. When someone she loves is accused of murder, chambermaid Lucy Campion interprets the clues herself, all while avoiding the murderer, the law, and the everpresent cold hand of the Great Plague itself. Those of us without a PhD in history often have a homogenized view of the past- so tell us a bit about England during the time A MURDER AT ROSAMUND’S GATE is set. Great question! A MURDER AT ROSAMUND’S GATE was set in the mid-1660s, a period of great political, social and religious contrasts. On the one hand, after years of civil strife and warfare, the Stuart line was restored with the return of King Charles II to the throne, ending years of joyless Puritan rule. The theatres were reopened, long-squashed festivals were revived, and a sense of frenzied pleasure and merriment returned to the kingdom. On the other hand, with the ousting of the Puritans from power, there emerged great religious tensions among the re-established Anglican Church, the much-disparaged Catholics, as well as the many dissenting religious groups, especially the Quakers. New political conflicts between Parliament and the King were an additional source of tension and stress as well. Within all these tensions, England faced an ongoing struggle for order. Exacerbating this struggle, between 1664 and 1666, two great disasters befell England, London most catastrophically. First, the plague struck heavily, killing thousands and thousands of people. Then, before the society could recover, the Great Fire of London swept through much of the city, destroying nearly 13,000 homes and rendering thousands homeless. Consequently, a remarkable–if temporary–social mobility and gender fluidity occurred among the survivors, as servants and apprentices took over their master’s homes and livelihoods, and women found new ways to speak. My assignment this month was THE ROMANOV CROSS by Robert Masello. This one came in when I was in the middle of another novel. This is not normally an issue as I have two weeks or so to complete the book I am on, leaving me plenty of time for the new one. However, this time I was only half way through Ken Follett’s monster WORLD WITHOUT END. That’s over 1,200 hundred pages for those who have not read it. The reason I mention this is that I was really enjoying the book and hated to put it aside so I could read THE ROMANOV CROSS. Not the best frame of mind to give a book a fair hearing I hear you say, and you would be right. However, Robert Masello didn’t need a fair hearing from me. The book grabbed me from the start and never really let go. This book is compelling. That’s not a word I use often in my reviews, you can check if you don’t believe me. The book shifts effortlessly between the time of the Romanovs just before the revolution and the present day.We are introduced to Anastasia, Grande Duchess and daughter of the last Tsar of Russia, Nicholas II as well as the always interesting Grigori Rasputin. There have always been suggestions that Anastasia may have escaped when the rest of her family were killed in 1918 by the secret police. Masello ties into this uncertainty linking reports of the families’ Haemophilia with a possible immunity for the Spanish Flu. Masello puts forward the hypothesis that the young woman escaped to Alaska, then owned by the Russians. It was at this time that the Spanish Flu raged across the world killing over 50 million people and the small community on St Peter’s Island, a remote, forbidding island, just off the coast of Alaska that was wiped out by the epidemic. Hailed as one of the genre’s rising stars, author Nancy Bilyeau transports us to 1538 in THE CHALICE where England’s bloody power struggle between crown and cross threatens to tear the country apart. Her heroine, novice Joanna Stafford, becomes caught up in a shadowy international plot targeting Henry VIII himself. So we had to ask . . .
Who were your literary influences when you were learning to be a writer? When I was in high school in Michigan and thinking of becoming a writer, I read a lot of different sorts of fiction: Daphne du Maurier, Stephen King, John Le Carre, E.L. Doctorow. I had a wonderful teacher who read RAGTIME aloud to us. In university I studied Ernest Hemingway, F. Scott Fitzgerald, Thomas Hardy, and T.S. Eliot. In the intervening years, I worked as a magazine editor and did not think about writing novels. Recently, when I did decide to give it a go, I’d say I was influenced by A.S. Byatt, Mary Renault, Katherine Neville, Ellis Peters, and Ken Follett.